Ladies earrings made of stainless steel and clear crystal. With the armani logo. Stud closure. Rose gLadies earrings made of stainless steel and clear crystal. With the armani logo. Stud closure. Rose gold plated. 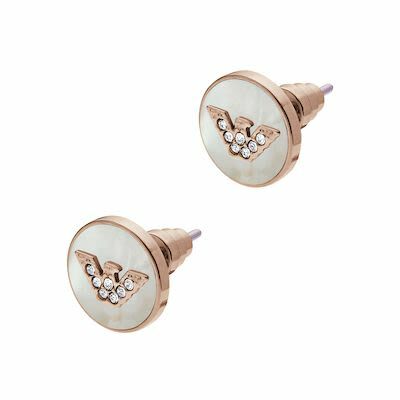 Add some sparkle to any look with these rose gold-tone stud earrings, featuring mother-of-pearl discs set with crystal-studded Emporio Armani logos. Earrings. Stainless steel. 2 year guarantee. Clean with soft dry cloth.old plated.